Whether it’s clearing snow in the winter or light grading in the summer, the 69 in. snow blade will quickly move and discard materials. Use the integrated joystick control to raise, lower and angle the blade up to 30 degrees left or right. The snow blade’s boxed-in back plate adds reinforcement for a stronger, more durable moldboard. Adjustable depth skid shoes prevent scraping by holding the height of the blade to clear obstructions like manhole covers or parking lot cracks. It also acts as a parking stand for quick and easy hook up. Rubber and poly cutting edges are available to prevent sparks and surface gouges. Since most snow is cleared at night or early in the morning, the snow blade is painted orange for improved visibility. Optional high visibility masts can be installed at each end of the moldboard to increase visibility of the blade’s corners. For even better visibility add the optional snow deflector, which keeps blowing snow off of the utility vehicle. Adjustable Skid Shoes: Prevents scraping by holding a set height of the blade, which prevents damage from obstructions like manhole covers or street cracks. Adjustable Springs: Adjust the tripping mechanism with the eyebolt for preferred tension. Boxed-in, Reinforced Moldboard: Boxed-in back plate adds reinforcement for a stronger, more durable moldboard and cutting edge. Cylinder Shear Bolt: Prevents extensive cylinder damage. Flip Down Parking Stand: Makes for quick and easy work of changing attachments. 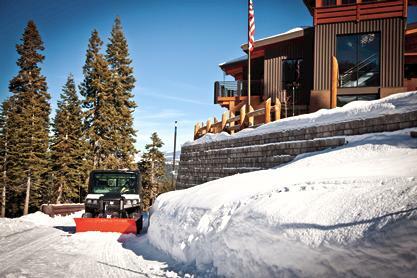 Hydraulically Angling Blade: Blade angles 30 degrees to either side to help move snow where you want it. Multi-Attachment X-Change™ (M.A.X.) System: Makes easy work of attaching and detaching the snow blade from the utility vehicle. Fast and easy mounting means spending less time on attachment changes and more time on the job. Painted Orange: Bobcat’s signature bright orange color makes the blade more visible and looks great with the utility vehicle during any removal job. Rolled Moldboard: Lets material flow away easily, meaning less drag. Tension Spring Trip Moldboard: Reduces potential impact damage to the snow blade if the snow blade contacts sections of raised concrete on sidewalks, manholes or other obstructions.